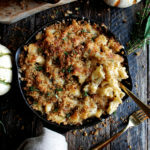 Unlike stuffing or mashed potatoes, mac and cheese isn’t a completely traditional Thanksgiving dish. 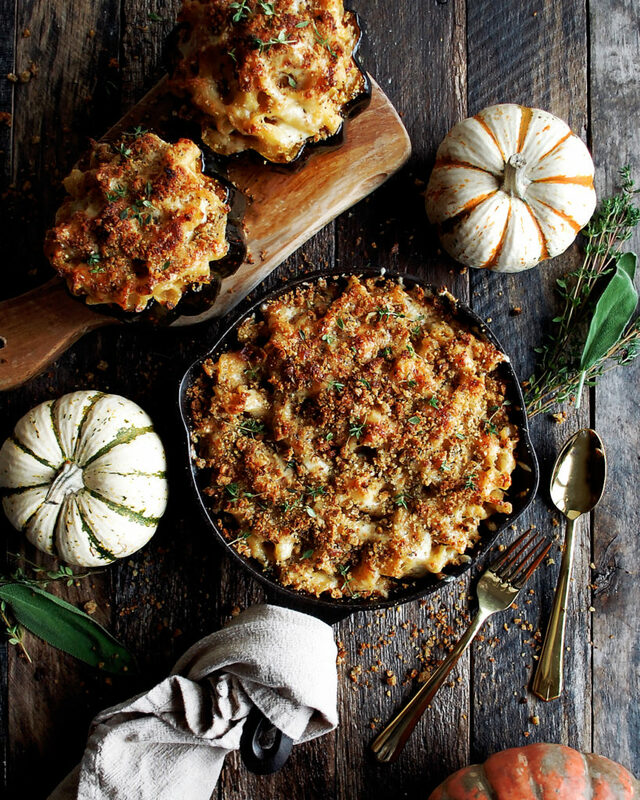 But, if it’s on the table it always gets devoured…and this baked squash mac & cheese is definitely the one you’ll want to make. I don’t know how to describe this dish to do it justice. It seriously is that good. 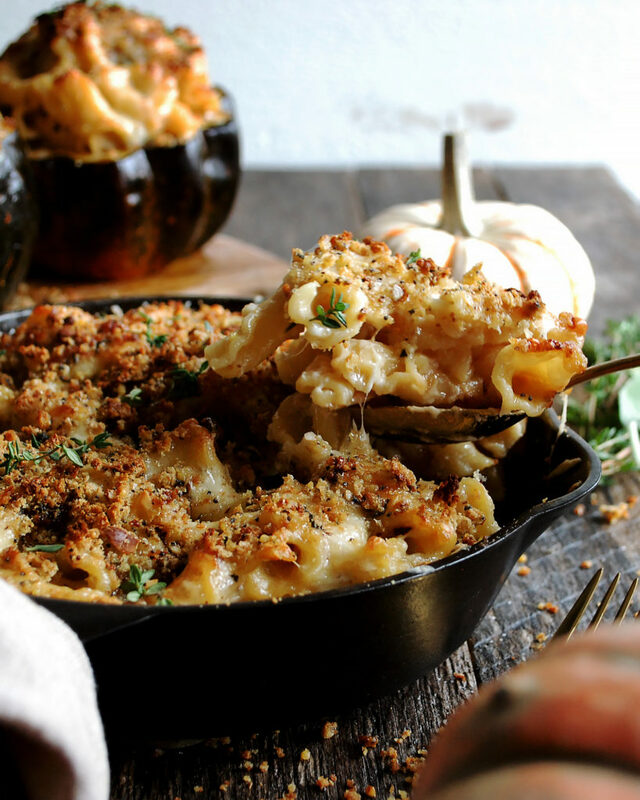 It’s just fall comfort food at its finest, and I don’t think you can ever go wrong with that! The first time I made this, I used gnocchi in hopes of creating a sort of “gnocchi bake”. It was good, but I realized that the sauce just doesn’t stick to the gnocchi like it does a regular pasta (especially this campanelle pasta because of all its nooks and grooves). So, I make it again (and ate it again) and the pasta turned it into everything I wanted… a creamy, decadent, and extremely cheese baked pasta dish. I use two cheeses for the sauce, a sharp white cheddar and a creamy fontina. And the sauce is basically just a béchamel, except I start by caramelizing onions, and I throw a few fresh sage and thyme sprigs in there for extra, hearty flavor. Plus, there’s prosciutto mixed in, too. And it is an absolute must (if you don’t eat meat, you of course can leave it out). It adds such a salty kick which is really nice against all the creaminess. While the mac and cheese is pretty awesome just poured into a skillet, topped with more cheese and sage breadcrumbs, drizzled with olive oil and baked…I roasted a few acorn squash as well to serve as “bowls” for the pasta. 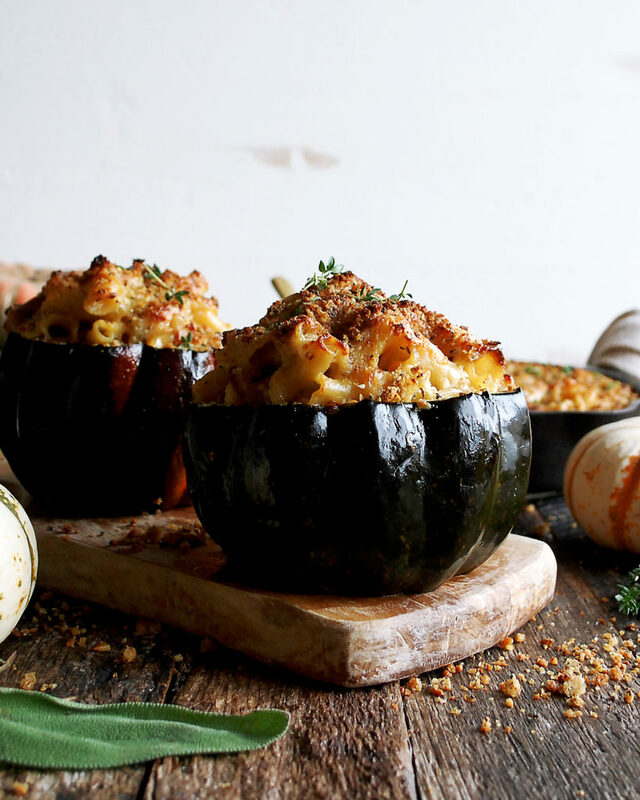 It’s a fun way to present the mac and cheese, plus it adds a layer of roasted squash with every spoonful. Preheat the oven to 425°F. Trim the ends off the bottom of each squash so that each one stands upright. Cut the tops of each squash, enough so that you reveal the soft part of the inside of the squash. Use a spoon to scoop out the seeds and stringy flesh. If needed, use a knife to cut down the flesh more to create a large space within the squash. Coat the squash with a generous amount of oil. Season the squash with salt and freshly cracked black pepper. Place the squash upright on the sheet pan. Roast the squash for 25-30 minutes until tender and slightly caramelized. Combine the bread and sage leaves in a food processor. Pulse until the bread mixture resembles fine crumbs. Set aside. Preheat the oven to 400°F. Bring a large pot of salted water to a boil. Meanwhile, heat a heavy-bottom pot over medium heat. Add enough safflower oil to coat the bottom. Add the onions and a pinch of salt. Saute the onions until golden and caramelized, about 10 minutes. Add the butter to the onions and let melt. Whisk in the flour. Let cook for about 3 minutes. Slowly add the milk, whisking continuously. Add the sage and thyme. Bring the milk to a simmer. Let simmer for about 8-10 minutes on medium-low until slightly thickened, stirring often. Remove and discard the sage and thyme sprigs. Stir in the cheddar cheese, 2oz of fontina cheese, and the prosciutto. Add the pasta to the boiling water and cook 2 minutes less than the package instructions. Drain the pasta. Add the pasta to the sauce and stir until completely coated. Taste and season with salt if needed. 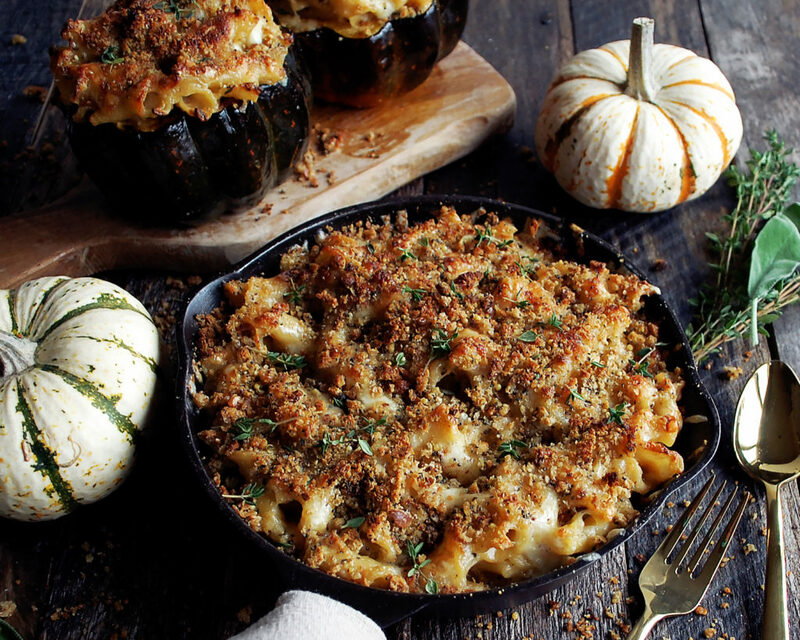 Distribute the mac & cheese into the squash, mounding the pasta high on top. 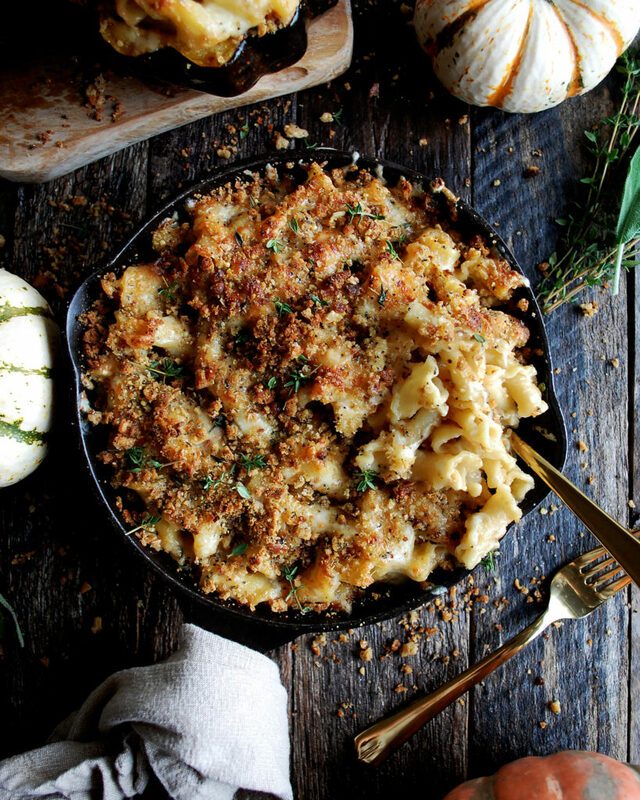 Spoon any extra mac & cheese into an oiled cast-iron skillet. Sprinkle the remaining fontina cheese over all the pasta. Distribute the breadcrumbs as well. Drizzle the breadcrumbs with a little bit of oil. Bake the mac & cheese for about 10 minutes until the cheese has melted and breadcrumbs have browned. 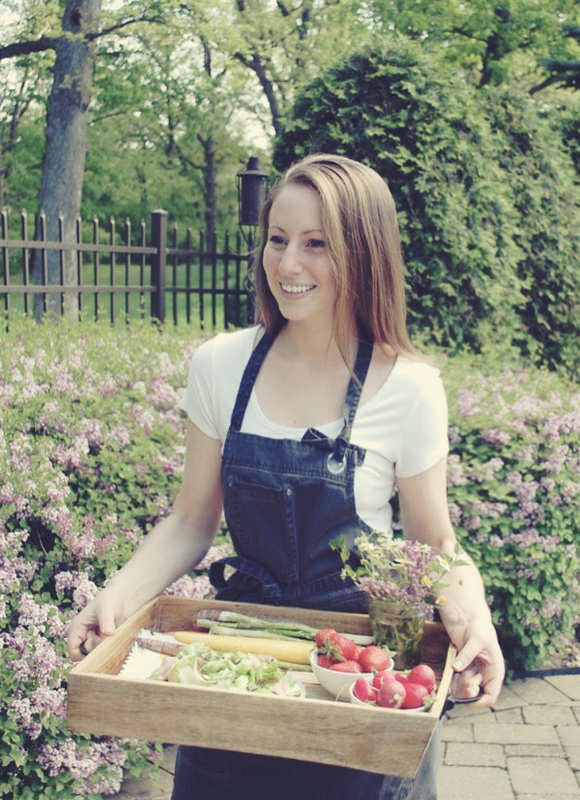 Garnish with fresh thyme. YES! People are going to love it. Have the best Thanksgiving! I see fontina is listed in ingredient list x 2 (2oz). Does recipe need 2oz or 4oz total? Hi Caroline! 4oz total. The first 2oz amount goes into the sauce, and the second 2oz amount gets added on top before baking (you can add even more on top if you’d like, too). I’ll clarify this in the recipe!